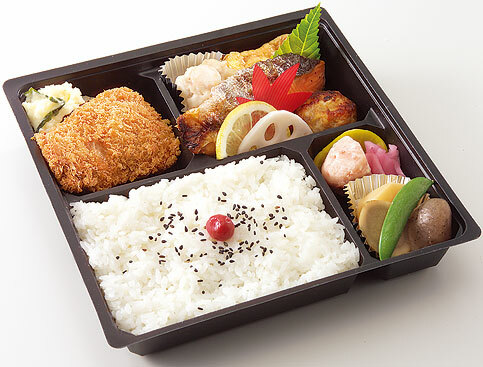 Rice balls (Onigiri) are a convenient take-out food, like sandwiches. 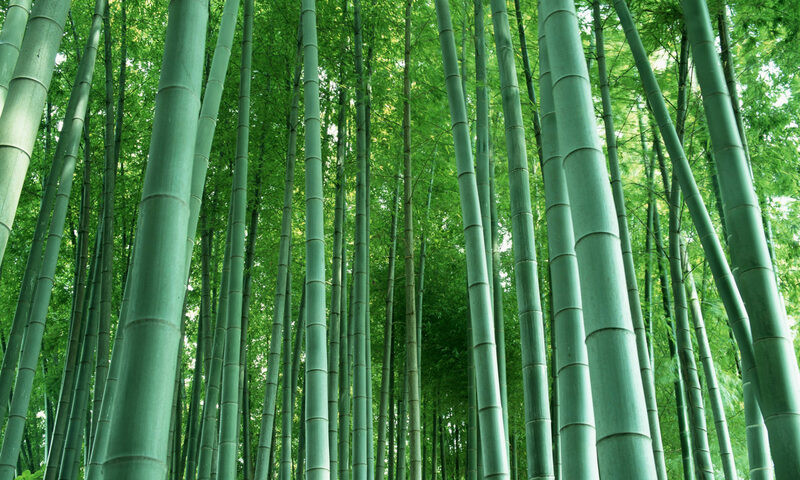 The most common shapes are round, oval and triangular. To make a rice ball, you squeeze lightly salted steamed rice into the desired shapes with your hands. Also, it is popular to put pickled plums, chunks of salted salmon in the middle of a rice ball. 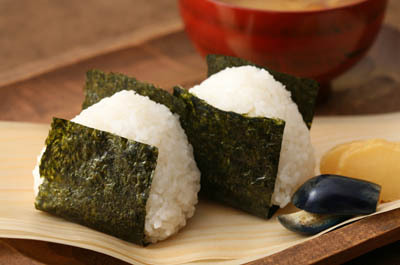 Rice balls are often wrapped in dried laver seaweed so as to make handling them less sticky. Sekihan is glutinous rice steamed with red beans. 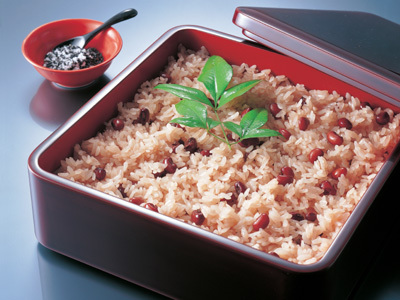 The Japanese word sekihan literally means “red rice” because the beans give a purple-red color to the rice. Sekihan is eaten on special and festive occasions such as birthdays, weddings, and holidays. A conveyer belt sushi (kaitenzushi) restaurants is popular in Japan. The customers sit at a U-shaped counter or at a table there. 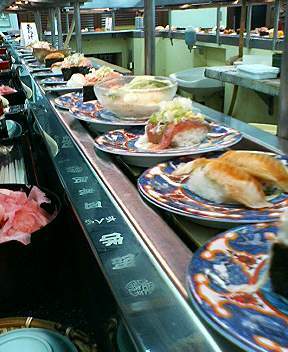 Around the counter and the tables, a conveyer belt slowly and constantly rotates and carries plates with sushi, salads, and desserts. Customers are supposed to pick up whatever plates they like from the conveyer belt. Natto is made from soy beans that are fermented by the natto fungus. Before eating, natto should be stirred until you produce many like spider threads. Then a little bit of soy sauce is added. 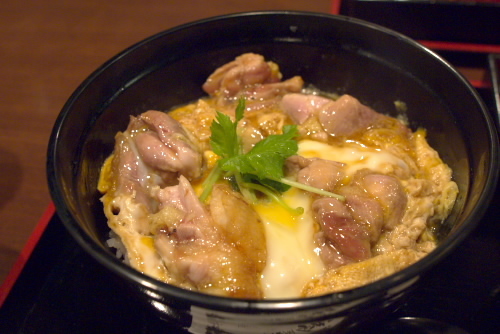 Some people like to put in chopped green onions, Japanese mustard and other condiments according to taste. 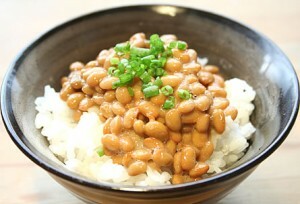 Most commonly, natto is eaten with steamed rice. 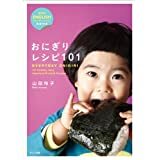 Because of the strong smell and sticky appearance, non-Japanese often have trouble when trying natto for the first time. 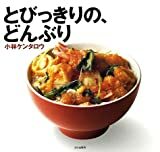 “Mito natto” made in Mito city, Ibaraki prefecture is very famous.